The 3rd European ISS resupply spacecraft was successfully orbited Friday 23 March by an Ariane 5 ES launcher from French Guiana. 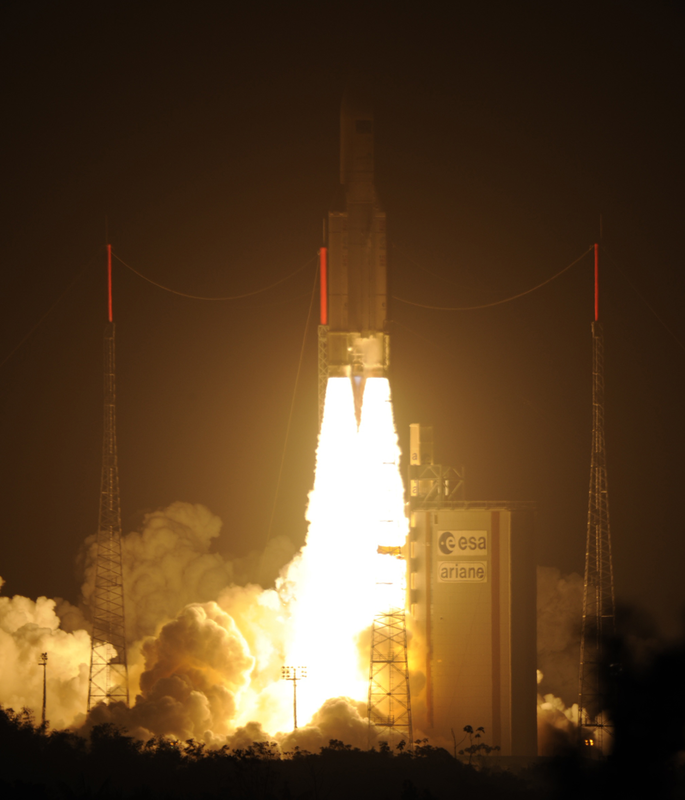 ATV-3 launch on Ariane 5. Credits : ESA/CNES/Arianespace/Optique vidéo du CSG. Ariane 5 accomplished another successful flight today from the Guiana Space Centre lofting into space the heaviest payload the launcher has ever carried, the ATV-3 Edoardo Amaldi (20,100 kg). Lift-off occurred at 5:34 CET. The launcher’s two massive solid-rocket boosters powered it off the launch pad and were jettisoned a few minutes later. The ATV was released into orbit at an altitude of 260 km, a little more than one hour into the flight. Its solar arrays were then deployed as planned to deliver power for the rest of the mission. The next stage of the mission will be the phasing of the ATV’s orbit to take it to the rendezvous point with the ISS, where it is currently scheduled to dock on 29 March (CET). The ATV-3 will stay berthed to the station for a maximum of 6 months. Its engines will be used to raise the station’s altitude. Once the ATV’s cargo has been offloaded, the 6-strong ISS crew will fill it with waste that will burn up with the vehicle on its destructive re-entry into Earth’s atmosphere late this summer. Launch replay. Credits : ESA/CNES/Arianespace/Optique vidéo du CSG.